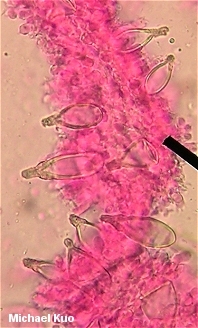 Identification of Hohenbuehelia species frequently depends, at least in part, on microscopic examination. The keys and descriptions in Thorn (1986) and Thorn and Barron (1986) treat most North American species (along with taxa in a few closely related genera). Alberto, E., A. Fazio & J. E. Wright (1998). Reevaluation of Hohenbuehelia nigra and species with close affinities. Mycologia 90: 142–150. Thorn, R. G. & G. L. Barron (1984). Carnivorous mushrooms. Science 224: 76–78. Thorn, R. G. (1986). The "Pleurotus silvanus" complex. Mycotaxon 25: 27–66. Thorn, R. G. & G. L. Barron (1986). Nematoctonus and the tribe Resupinateae in Ontario, Canada. Mycotaxon 25: 321–453. Thorn, R. G., J.-M. Moncalvo, C. A. Reddy & R. Vilgalys (2000). Phylogenetic analyses and the distribution of nematophagy support a monophyletic Pleurotaceae within the polyphyletic pleurotoid-lentinoid fungi. Mycologia 92: 241–252.